In this second of a series looking at the wisdom of great investors, we focus on the impact that emotional decision making can have on investment outcomes. Emotions can wreak havoc on investor returns. Keeping them in check is critical to building long-term wealth. 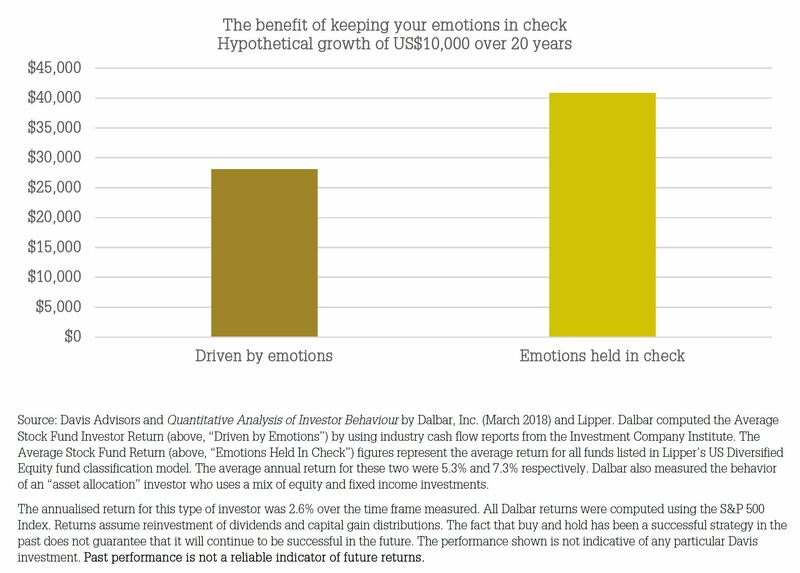 Over the past 20 years, investors who keep their emotions under control built considerably more wealth than investors who were driven by their emotions: US$40,810 versus US$28,057. To build long-term wealth, investors must remain disciplined, unemotional and focused on long-term goals in the face of inevitable market volatility. This document has been prepared by PAN-Tribal Asset Management for use by sophisticated investors and investment professionals only. No account has been taken of the investment objectives, financial situation or particular needs of any particular person. This document is provided for general information purposes only and does not contain investment recommendations nor provide investment advice, nor is it intended to take the place of professional advice. Investors should not take action in reliance on information contained in this document. We strongly encourage investors to obtain professional advice and to read the Fund’s current Product Disclosure Statement (PDS) and the Reference Guide which forms part of the PDS before making any investment decision. Investors may invest in the Fund through a licensed financial adviser or an investment platform using the PDS for that platform which can be obtained from the operator of the platform. Applications to invest in the Fund must be made on the application form which can be downloaded from www.pantribal.com.au or obtained by contacting PAN-Tribal on (03) 9654 3015. Equity Trustees Limited (Equity Trustees), ABN 46 004 031 298 AFSL 240975, is the Responsible Entity for the PAN-Tribal Global Equity Fund (the Fund) ARSN 602 036 153 and PAN-Tribal Asset Management Pty Ltd (PAN-Tribal), ABN 35 600 756 241 AFSL 462065, is the investment manager and the issuer of this information about the Fund. PAN-Tribal has appointed Davis Advisors as the sub-investment manager of the Fund. Equity Trustees is a subsidiary of EQT Holdings Limited (ABN 22 607 797 615), a publicly listed company on the Australian Securities Exchange (ASX: EQT). None of PAN-Tribal, Davis Advisors, Equity Trustees nor any of their related parties, their employees or directors nor any other person guarantees the repayment of capital or the performance of the Fund(s) or any particular return from the Fund(s). No representation or warranty is made concerning the accuracy or reliability of information contained in this document, nor liability accepted to any person who relies on it. Past performance should not be taken as an indicator of future performance and is provided for illustrative purposes only. Charles Munger is not associated in any way with PAN-Tribal Asset Management or Davis Advisors. This document was issued on 30 October 2018. © 2018 PAN-Tribal Asset Management Pty Ltd.
PAN-Tribal Global Equity Fund upgraded!